May is the new October! I think I'm going to start posting every other day from here on out, if anyone has a problem with that feel free to post a comment and I'll cherish the fact that there are, indeed, readers of my little blog out there. 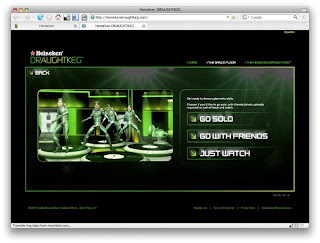 It's still a micro-site world out there, and Heineken is no different. 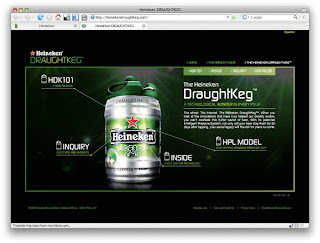 There isn't much to the main site, but a click away is the Draught Keg microsite. Walking out of the commercial, the robot lady struts her stuff on the site while you decide if you want to hit the dance floor or learn more about the keg. I was slightly worried that Hit the Dance Floor would be yet another Guitar Hero-ish game, but it was just another Upload Your Photo or friends photo app. 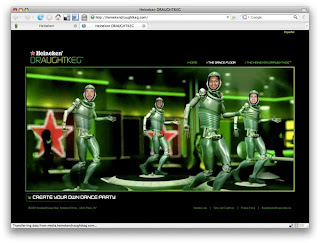 The upload puts your picture(s) into the faces of these odd dancing robots. I have to admit I uploaded co-workers photos and watched them dance. The other portion of the site is the information on the keg itself. This ends up being just a regular hot-spot oriented info dump. I'm a Digital ACD in Advertising land. I have been in love with the internet for over 10 years now. And I have a Red Bull problem. There I said it. I travel around different industries every week or so and look for interesting and tasty interactive bits. I hope to make this a place for ad folk to keep up to date. And I just enjoy the spelunk. "There is a creative solution for everything." "Sometimes, to be successful with Social Media, don't start a conversation. Start an argument." "This is no longer the Age of Information, it's the Age of Opinion." "The work that comes out of an Agency is the result of not going crazy while doing it."